You are here: Home / marketing pilates / What will a regular newsletter do for your Pilates/Yoga Studio? What will a regular newsletter do for your Pilates/Yoga Studio? Most importantly — a regular newsletter will connect you with your ideal clients and increase sales. The last newsletter we did for Rivercity Pilates in February resulted in 6 new client appointments in the first 4 days after we sent it! SIX!!!! I’ve been surprised at how many Pilates Studio Owners tell me that they try to do a regular newsletter, but they can’t seem to execute releasing a newsletter on the first of every month! I invented some tools to help YOU create a newsletter in 4 steps — and I’ll be teaching you how to use them in my “Anatomy of a Pilates Studio Newsletter” on February 19. 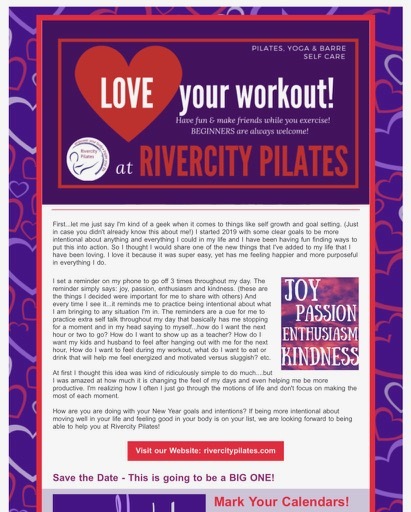 This is the first section of the February Newsletter for Rivercity Pilates that resulted in 6 new students in 4 days. I’ve been spending some time working for a friend of mine in a retail exhibit booth at an event, and while it’s a whole different realm than Pilates, her ideal clients are also ideal clients for Pilates studios. We’ve been talking to them, asking questions, asking if they follow her boutique on Facebook. There’s a lesson here about asking your clients if they follow you on Facebook but that’s a blog for another day. I’ve been surprised at how many people have responded with something like “I got your newsletter saying you’d be at this event this week”. More evidence that a newsletter is a great way to connect with your ideal clients. A newsletter doesn’t have to be long, but it does need to be focused and it needs to have calls to action that encourage people to engage with you! More reasons to do a regular newsletter? Your newsletter will increase sales. Your newsletter will educate clients and build your reputation as being an “expert in your field” in your community. Your newsletter gives people a peek “inside” your doors. Let them see the type of people that take classes (diverse ages, shapes, etc), let them connect with your instructors and clients. Let them imagine themselves in your studio. Your newsletter helps you be organized. If you make the effort to organize your new class offerings & options for beginners, you will have a “to-do” list to work from for the month. You’ll be able to create Facebook events and Facebook ads, and create posters for your studio with upcoming events. Your newsletter can highlight pages/sections of your website that you want clients & potential clients to see! Your newsletter will remind people that you are there, that others are coming to your studio, and if they want to start exercising they will think of you first! Your newsletter will give your clients something easy to share. It’s like handing your favorite trusted clients a business card except they are more likely to pass this along and not lose it in their purse! Your newsletter is a chance for you to tell a story that will connect to your ideal client and let them imagine themselves taking advantage of your services. Your newsletter will build community. By featuring clients, instructors and sharing stories about the studio your clients and potential clients will get to know you and feel more comfortable as a new client! Consistency compounds to create results ~John Maxwell……. Being consistent in your marketing and being in front of clients isn’t easy and there are not often instant results, which is why so many people quit. It is not one magical newsletter or post or ad that creates sales….it is lots and lots of consistent posts over time, consistent ads, and a consistent monthly newsletter! How can you create a newsletter every single month that will get you the results that you are looking for? 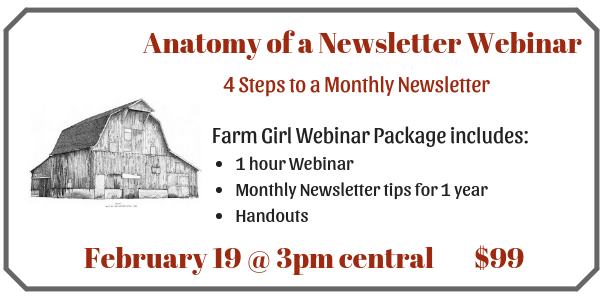 I’ll give you 4 easy steps to follow to create a newsletter in my webinar “Anatomy of a Pilates Studio Newsletter” on February 19th. You will receive structure and tools to help you create a monthly newsletter that clients and prospective clients will be talking about! Previous Post: « Want an easy way to get more Instagram Followers?